When George RR Martin was a kid growing up in Bayonne, NJ, he probably never imagined that this wonderful imagination and amazing storytelling would bring his characters to life and take them halfway around the world to film a television show based on his books. The series of books, A Song of Ice and Fire is the creativity and imagination of Martin, which HBO bought the rights to in order to make the beloved show, Game of Thrones. Filming of the second season of this wonderful show went to Croatia, where the city of Dubrovnik and nearby locations allowed exterior shots of a walled, coastal medieval city. The outer layer of the Walls of Dubrovnik, the Fort of St Lawrence and the rest of the Dubrovnik’s historic center were used for scenes in King’s Landing and the Red Keep. The nearby island of Lokrum, the Rector’s Palace in the Old Town of Dubrovnik and the Dubac quarry were used for scenes set in Qarth. Croatia was subsequently used for filming in the remaining seasons of the show. Dubrovnik is the southernmost town of Croatia, located at the tip of the sunny Dalmatian coast by the border with Montenegro and Bosnia & Herzegovina. The magnetic appeal of the perfectly preserved medieval fortifications is often quoted as the main reason to visit Dubrovnik, along with the mild Mediterranean climate, pristine clear waters of the Adriatic Sea and the dramatic backdrop of karst mountains. Despite the town’s relatively small size – its population doesn’t exceed 50,000; Dubrovnik has long been considered the ‘tourist capital’ of Croatia, topping the list of places to visit while in Croatia or in the region. Dubrovnik is a town of glorious and turbulent history. For over 450 years, it used to be the capital of a small independent state, the Republic of Ragusa, and the most powerful commercial center on the eastern coast of Adriatic. The scope of its maritime trade was so large that it even rivaled the dominant force in the Mediterranean, the Republic of Venice, with whom it clashed on numerous occasions. It also played an important role in the complexed diplomatic game between the mighty Ottoman Empire and Christian Europe. Its influential position was lost with the Napoleonic conquest in the early 19th century when it was captured and annexed by the French and later by the Austrian Empire. In that period Dubrovnik became only a shadow of its former self, but the abundance of historical attractions combined with the spectacular natural beauty of its surroundings enabled it to establish itself as a regional tourist hotspot. The tourist industry began developing already in the late 19th century and has reached its peak in the 1970s and 1980s. In spite of being a part of the communist Federation of Yugoslavia at the time, Dubrovnik primarily attracted western tourists becoming one of the most popular European tourist destinations. However, its tourist development became severely compromised in the early 1990s with the breakout of war in former Yugoslavia. Battered and bruised, Dubrovnik rose from ashes once again in the late 1990s, when it slowly but surely acquired the status of the leading tourist brand of a young independent Croatian state. The former proud capital of the maritime Republic of Ragusa and the ‘tourist capital’ of Croatia found itself in the new and exciting role of the ‘capital of Seven Kingdoms of Westeros’ in 2011. 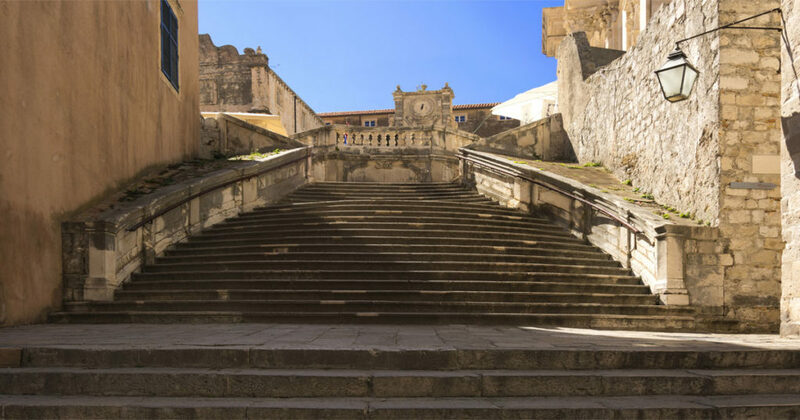 It was then when the HBO decided to replace the Maltese town of Mdina with Dubrovnik as the main setting of their award-winning TV-show ‘The Game of Thrones’. For the fans of the show from that moment on Dubrovnik had become synonymous with King’s Landing. The popularity of the show boosted the interest for this truly remarkable city as its magnificent medieval fortifications; splendid renaissance palaces, lush gardens, and captivating landscapes became recognizable all over the world. Whatever you prefer to call it, the effect will be the same as you will be swayed by the magnificent vistas and rich cultural heritage once you set your eyes on this enchanting walled city. And you will realize that there is no place better suited to capture the spirit of George R.R. Martin’s ‘A Song of Ice and Fire’ world than Dubrovnik. Visit Dubrovnik today and Tour the Game of Thrones. We did a GAME OF THROWNES TOUR with Tom on 3/8/16. He was brilliant, his local knowledge & hystory was fantastic he did it at a perfect pace, he gave us valuable advice on our further adventures in Croatia, as well as personal experiences of his life. We highly recommend Tom to future clients & would go as far to say he was our best guide through Croatia.